Competitive gaming is bigger than ever. With popular FPS games such as Overwatch and Call of Duty, gamers look for any edge to gain the upper hand. 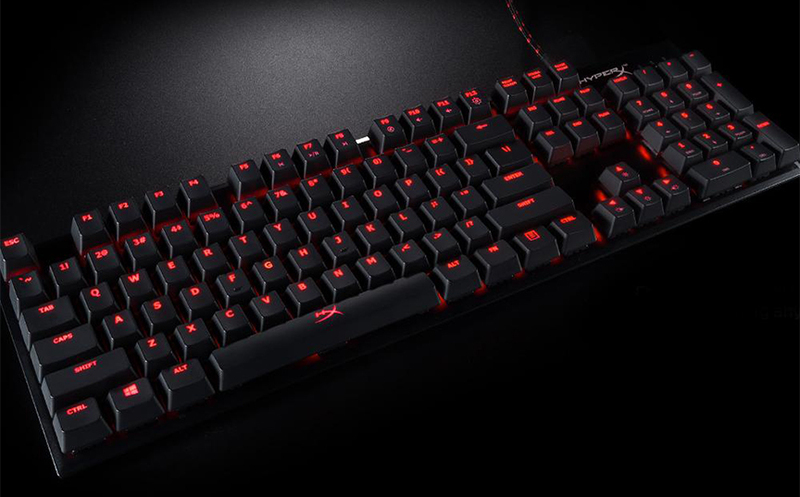 Kingston gives us a solution with the HyperX Alloy FPS Mechanical gaming keyboard. There are a lot of gaming keyboards, but Kingston pushes the bar on what to expect from a gaming keyboard with the Alloy FPS. Designed specifically for pro gaming, the Alloy FPS sports a solid-steel frame and compact design to free up space for your mouse. While sporting a full size keyboard with 10-key, it’s conveniently small but feels heavy and sturdy. The Anti-Ghosting and full N-key rollover allows you to quickly press multiple keys without missing a command/action. A detachable cable and portable pouch make it easy to grab and go in tournaments. Plus the added USB port gives you the option to charge your mobile device without typing up the USB slots on your PC. The Alloy FPS is easily one of my favorite gaming keyboards. With FPS in mind, it feels complete and ready to go for my needs. Being compact, I feel like I can place it anywhere on my desk without feeling overpowering. The added textured FPS keys make it easy for me to easily feel where my main WASD keys are plus the first 4 numbers. Hand placement feels natural by being able to feel the difference between the two types of keys. Especially in those intense matches if you jump for joy in an upcoming victory but see the enemy making a comeback, you don’t have to look down to find the WASD since the textured keys help identify them without seeing them. While playing Paladins I noticed the Alloy FPS was more responsive than my previous mechanical gaming keyboard. And though small, the weight of the keyboard kept it in place no matter how crazy the match got. I never worried about the keyboard sliding around, even with the angled hinges holding it up. And with each keystroke I pressed, each grenade I threw or special I activated, the Alloy FPS made it feel like I was playing like a pro even in my non-ranked casual matches in Paladins. Kingston has already made its name in the PC market with its selection of memory products. Now Kingston is aiming to leave an impact in the pro gaming market. The HyperX Alloy FPS Mechanical gaming keyboard is the keyboard the pros expect. Compact design with a full size QWERTY and 10-key, it’s designed to grab and go. I can’t say that I miss my old keyboard, because I don’t. The Alloy FPS is designed so well with many convenient perks like the USB charge port. I can’t find anything bad to say about it other than maybe if it was blue instead of red, but that’s just me. While most competitive gaming keyboards can be easily over $100, the HyperX Alloy FPS Mechanical gaming keyboard is a bargain at only $99.99. It’s a purchase you won’t regret and will instantly notice an improvement in your gaming. The HyperX Alloy FPS Mechanical Gaming Keyboard is available now at hyperxgaming.com. A unit was provided by the company for this review.